First, a caveat: Most Germans grill over hibachis or small, electric grills (to minimize smoke). Sometimes they grill on their balconies, but when this is not allowed, parks are used where open fires are not often permitted. 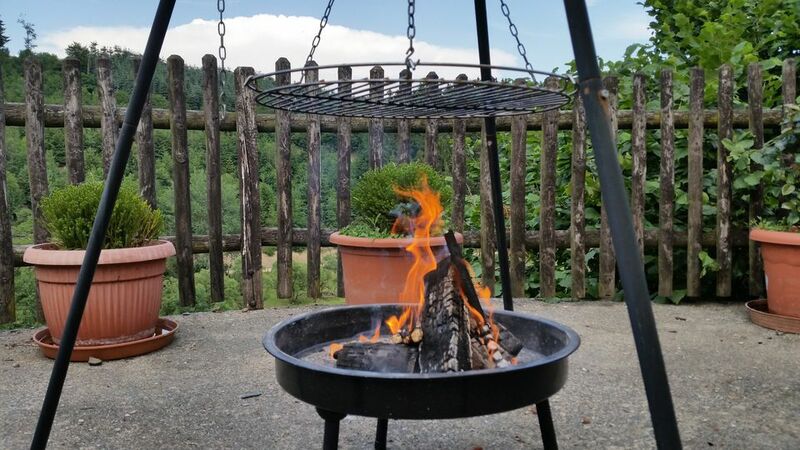 If you are lucky enough to own a "Schraebergarten" (a small community of gardens), however, or be in a forested area where "Schwenkers" are allowed, you may enjoy the fun of an open beechwood fire and a grill suspended from a tripod set up. Originating in Saarland (southwest Germany, borders France) and adopted all over Germany, the "Schwenker" is a fun and delicious outdoor past time. A tripod is very stable on uneven terrain and can be put together and taken down with few tools. This grilling set up is truly low-tech and yields great results. Lyoner sausage - rolled into a coil. Some bratwurst s come this way, too. In Germany, you can often buy pork cutlets ready-to-grill at the butcher's, but in the US, you will probably need to make your own. A German pork cutlet or "Schnitzel" is a cross-section of a shoulder roast, cut 1/2 to 3/4 inches thick. It has meaty sections tied together with fat and connective tissue. This tissue keeps the meat moist while grilling. So now you are ready to grill. You have thoughtfully brought along three pieces of metal, each about six or more feet long. Also in your kit is a non-flammable way to knot them together at the top. To build the tripod, use six-foot fence posts, sturdy rebar, or other metal material. Lean them together in a triangle and wrap electric fence wire around the top to hold them. Move the tripod and position it over the fire. Ideally, you will want to raise and lower the grill to better control cooking times. You can borrow a grill from the smoker oven or similar device. A heavy-duty chain can be cut into several pieces with wire cutters to hang the grill. Suspend the grill from the chain (in a triangle). Check and adjust the grill carefully for balance. Start your fire about an hour before grilling. Traditionally, beechwood is used but you can use any other well-burning wood. Beechwood does impart a specific flavor, but its unavailability should not stop you from grilling. You may also make a charcoal fire for this project. Now you are ready to grill on your traditional Schwenker!